Modern chemistry provides us with a deeper understanding of fermentation, but that does not necessarily translate into an easier interpretation of medieval recipes. Our modern brewing methods and sanitary measures have evolved, and the language and terminology used in brewing has changed over the years. (Anderson, 2005, pp.5-24) The arcane language of early medieval recipes often makes modern interpretations approximations at best, and modern brewers with their own interpretation of the same recipe make variations which sometimes differ slightly and sometimes substantially. This article takes an in-depth look at two 14th century English mead recipes and discusses alternate interpretations of specific cooking terminology as applied in medieval brewing. Our modern understanding of the chemistry involved in fermentation does not necessarily translate into an easier interpretation of medieval brewing recipes. Hieatt and Butler (1985, p.150) make suggestions on how to interpret and recreate two medieval mead recipes (no. 9 and 10), in V: Goud Kokery which is part of the 14th century manuscript Curye on Inglysch. In experiments to recreate these recipes, those suggestions were followed. Recipes and processes from manuscripts of a similar time frame were used to compare and determine whether, and if so where, the editors’ interpretation had diverged. The two recipes in question; no. 9 and 10 from the 14th century manuscript V: Goud Kokery. 10 To make fyn meade & poynaunt. Both recipes are meant to produce mead and so the most important ingredient, and therefore the first examined, is the source of honey. Locating the source of fermentable sugars – the honey – at the same time also pinpoints the source for fermentation: the yeast. Medieval sources indicate 14th century honey would have been available in different states and of different quality, unlike modern commercial honey which is always extruded, filtered, and pasteurized. The highest-quality honey was “life honey”, which is the honey that drips out when comb is removed from the hive (e.g. Hyll, 1579, Cap.xxiiij. ; Butler, 1609, P.2, C.10, 3; Hieatt and Butler, 1985, p.150;) and was highly regarded both in brewing and in medicine. (a.i. de Vreese, 1894) What makes “life honey” unusual, and literally alive, is that even though honey is antibacterial, it is a welcome host for osmophilic yeast strains like Saccharomyces rouxii, Sacharomyces var. osmophilus and Sacharomyces bisporus var. mellis. (Rasmussen, 2014, p.21) Osmophilic yeast is able to thrive in highly concentrated sugar solutions, and is best for the fermentation of honey solutions with sugar concentrations above 15% (ibid. ), but generally does not produce alcohol as well as the common beer and wine yeasts. Also, as the starting sugar concentration or density is high it will have a slow start, especially compared to pitching modern concentrated yeast. Temperatures exceeding 154ºF / 68ºC will kill the ambient osmophilic yeast (Hagen, 1995, p.148), as opposed to 120ºF / 48ºC for S. cerevisiae. A lesser second quality honey was that which could easily be leaked out and strained when breaking up or gently crushing the comb cell structure (equivalent to our centrifugal extruded honey). A third quality was the washings of the leaked combs in heated water, whereby the leftover and crystallized honey dissolved but the wax did not melt (Hyll, 1579, Cap. xxiiij.). Sometimes a waste grade was noted, whereby the washed combs would be squeezed in a twisted bag press to get the last bits of liquid out. This grade was often used for servants, and not at all recommended by the 16th century Charles Butler, who warns “& some (which is worse) doe violently presse it out. But by these means they shal have no fine & pure raw hony, howsoever afterward they handle it” (Butler, 1609, P.2, C.10, 9). By the 14th century, inoculating the brew with barm (yeast from a previous brew) instead of “life honey” becomes the standard, resulting in the term “life” losing its specific meaning and came to mean quality, high grade, instead (e.g. Digby, 1669) (See Figure 1). Washing would be facilitated by agitation by hand, which would also keep the water temperature in check to make sure it did not get hot enough to melt the wax (upwards of 144ºF / 62ºC). Coincidentally, if honeycomb is warmed enough to dissolve the sugars but not enough the melt the wax, the ambient yeast is able to survive to start fermentation. This was well observed by Lawson: “Let no fire come neere your hony, for fire softeneth the waxe and drosse, and makes them runne with the hony. Fire softneth, weakeneth, and hindereth hony for purging” [foaming, indicates fermentation] (Lawson, 1631, p.106). As the sugar concentration of washed honeycomb must is unknown – not enough honey will make weak mead which spoils much quicker, while too much honey can inhibit yeast growth giving competitors a chance – it was up to the experience of the medieval brewer to judge whether it was at a viable strength. In this regard, using high-sugar-concentration-loving osmophilic yeast is beneficial, as fermentation can occur quite easily without effort by the brewer (Rasmussen, 2014, p.21). By the 15th century the transfer of barm from one brew to another became commonly known (Rasmussen, 2014, p.21). as indicated by the shift in medieval recipes from not indicating any source of yeast to specifying using barm of a previous brew (Unger, 2004, p.152). This transfer of barm, consisting of the beer/wine yeast S. cerevisiae that has a narrow optimal fermentation range, also opened a need for a more specific technique of measuring the sugar concentration of the honey must. By the 16th century this need was covered by the introduction of the floating egg test, a Renaissance density test first used in making soap with wood ash lye (See Figure 2). 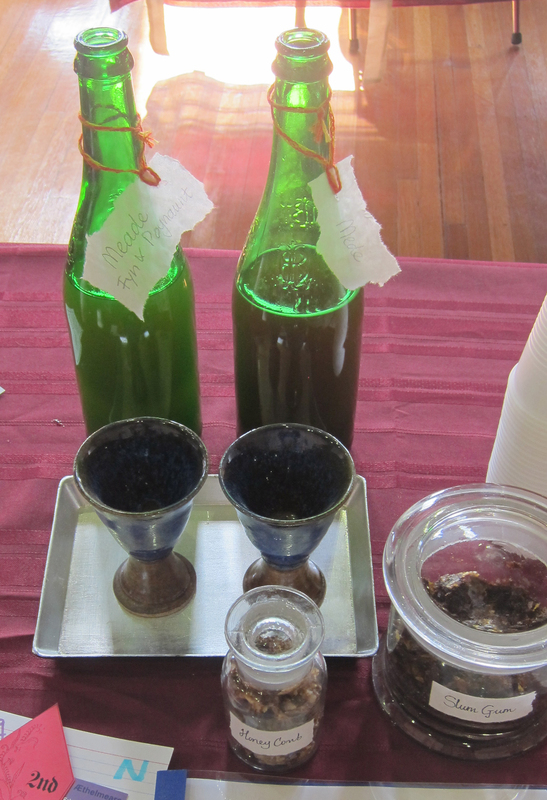 Next is to look into the cooking process indicated by the two mead recipes: how did the honey become must. Many medieval recipes advise to boil the must. While the source of medieval water could have been of questionable quality, for the flavour of the honey it is better to boil water separately, and add the honey when it is blood-warm to then start fermentation. According to Butler (1609, P.2, C.10, 10),“The best way is to put it into an oven after the batch is forth, but not before you can abide to hold your hand upon the bottome, for feare of overheating the hony” indicates heating above temperatures which would hurt the skin, was already known to damage honey. Maybe, even though in cooking the term ‘boil’ is interpreted literally, in brewing it might mean the process of cooking. Unless re-fermentation during warm weather is meant, which confuses the matter even more. As Hugh Platt (1594, pp.63-64) complains, “If any sweete Wines happen to reboile in the hot part of the Summer, as manie Vinteners to their great losse have oftentimes felt”. The word ‘seethe’ or ‘seething’ is even vaguer. Does it mean simmering, or, being at a boil but not bubbling? Or does it mean the process of heating, which could be anything from above room temperature to near boiling? For instance, recipe 9 To Make Mede uses both boile and seethe “& thanne take that forseid combis & sethe hem in clene water, & boile hem wel” (Hieatt and Butler, 1985, p.150), but after all that the combs should still be intact enough to be pressed out: “After presse out thereof as myche as though may”. This would indicate the water temperature did not actually exceed 144°F / 62ºC and melt the wax. Thus instead of translating the following quote to “take the previously mentioned combs & simmer them in clean water, & boil them well”, should it perhaps be “take the previously mentioned combs & heat them in clean water, & cook them well”? Since the latter interpretation matches the contemporary technique “set it in some vessel over a soft fire, and stil keep your hand in the vessel stirring about the honie and the wax, and opening the wax piece-meale until the hony and not the wax shal be molten” (Butler, 1609, P.2, C.10, 8), and is functional, this would seem to be the correct interpretation. And as ambient yeast survives heating up until 154ºF / 68ºC (Hagen, 1995, p.148), this would also mean the must is still viable for spontaneous fermentation, without the need for adding barm or lees from a previous batch. To check this statement, several medieval mead-making experiments were undertaken. It was learned that if honeycomb is literally simmered and boiled, the wax will melt and disperse into the honey solution. Interestingly, while the combs are quite bulky in their solid state, once they are melted within the honey solution, the wax will not be recovered in the same amount. In one of these experiments, the combs were boiled in clean water and poured through a cheesecloth filter while hot, and in another experiment the combs were boiled, the must was cooled down first, and then poured through a cheesecloth filter. Filtering the waxy must while hot particularized the wax, which then solidified into tiny particles that mostly stayed suspended in the must. During fermentation a thin film of wax particles formed on the surface, which did create quite a nice oxygen-free surface protection. After bottling the mead, the wax particles would form a haze around the neck of the bottle and a waxy residue was noted during consumption. 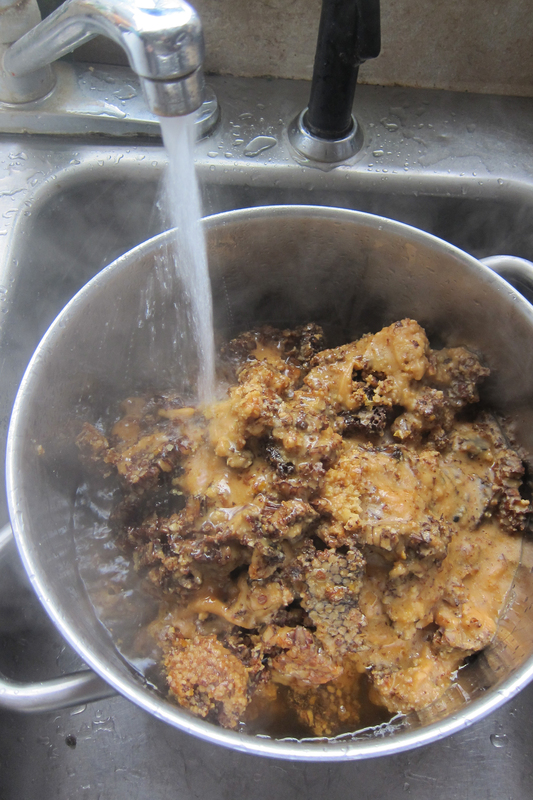 Most of these factors were negated by filtering the wax must after cooling, though the waxy residue did not completely disappear. The amount of wax comb that went into the must and the insignificant amount that was recovered during filtering indicate most did indeed stay in solution. As there should be comb structure left to be pressed after boiling, this result indicates that boiling the comb to dilute the honey is not the correct technique. Also, the wax adds a notable taste to the must. Based on these results, the interpretation of the initial translations was re-evaluated (See Figure 3 and 4). Take honey combs, and put them into a big vessel & lay in there big sticks, & lay the weight on it [of the combs] until it runs out as much as it would; & this is called life honey. & then take those mentioned combs & simmer [heat] them in clean water [not hotter than your hands can take], & boil [cook] it well. After press out of it [the combs] as much as you can & cast it [the liquid] into another vessel into hot water, & heat it well, & scum it well, & do thereto a quart of life honey. & then let it stand a few days well closed up, & this is a good drink. 10 To make fine mead & poignant. Take 20 gallons of the previously mentioned pomys cooked in 3 gallons of fine wort, & take 1 gallon of life honey & simmer it well & scum it well until it is clear enough; & add to it 3 pennyworth powder of pepper & 1 pennyworth powder of cloves & let it boil well together. & when it is cold put it into the vessel of the barrelled up previously mentioned mead; add it to it, & close it well as it is said before. With this interpretation, recipe 9 can now be successfully emulated, but recipe 10 is still puzzling. The immediate question with recipe 10 is the meaning of the word “pomys”. From its similarity to the word “pommys” it would seem self evident it refers to apples (linguistically via the French word ‘pomme’ for apple), which is also the conclusion drawn by Hieatt and Butler, (1985). The word “pomys” translates to modern English ‘pomace’: “(especially in cider-making) the pulpy residue remaining after fruit has been crushed in order to extract its juice”. 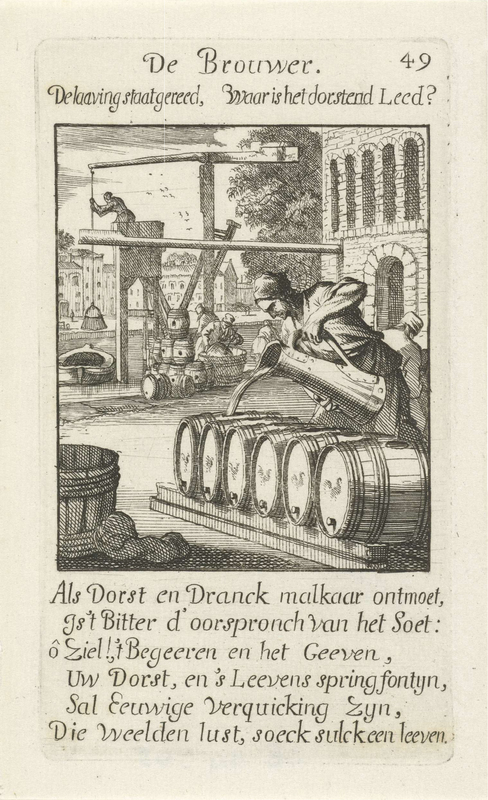 Fermentation with apple pressings was found to be unsatisfying, and as the word pomace refers to any solid remains after pressing fruit for juice or oil, like pomace olive oil, made from repressing olives for a second-grade oil, an alternate interpretation was sought. And while Harrison does mention “In some places of England there is a kind of drink made of apples which they call cider or pomage”, (Harrison, 1577, Book III, Chapter I) as traditionally the term pomace is used for the solid leftovers from pressed fruit, like the skin, pulp, seeds and stems, but the recipe calls the pomace ‘sodden’ or soaked pomace, forgoing the option of pomace meaning apple juice (See Figure 5). Hieatt and Butler (1985, p.150) assume “the ‘forseyd pomys sodden’ evidently refers to a recipe the scribe has omitted” as “despite the initial directions, no recipe calling for cooked apples actually occurs in the vicinity of this one”. When recipe 10 was experimentally emulated with “pomys” meaning apple, which would make a spiced apple wine sweetened with honey and malt, the ratio of apple solids and fermentable sugars to liquid did not make a functional recipe. To properly ferment a certain amount of apple solids, it would need to be at least submerged, which combined with the direction to cook it “soden in iii galouns of fyn wort” made for apple sauce consistency. When enough water was added to create an acceptable cooked apple wort, the amount of fermentable sugars became too low for a proper ferment. If the water ratio was balanced for a short mead ferment, the must was so dense it was difficult to both get a good ferment, and have liquid left over at the end, as the apple pulp functioned as a sponge. This recipe had a tendency for the apple pulp to create an impermeable pancake that would get pushed straight out through the airlock by the collected fermentation gasses, which necessitated breaking up and stirring the pulp back down every other hour or so until primary fermentation slowed down. In other words, in this configuration the recipe does not work and the resulting brew would spoil prematurely on a regular base, another indication of an unbalanced recipe (See Figure 6 and 7). If “the forseid pomys sodden” is to be taken literally as something cooked from the previous recipe, then the question is what is both pressed and cooked. The bulk honey from recipe 9 does not come from leaked honey but from washed honeycomb: “& thanne take that forseid combis & sethe hem in clene water, & boile hem wel”. When the alternate interpretation for ‘seething’ and ‘boiling’ is used, the directions to “heat them in clean water, & cook them well” would generate leftover combs, which are then “presse out thereof as myche as though may”. If the alternate interpretation is not used, and the must is literally simmered and cooked, then the wax comb would have melted and there would be nothing left to be pressed. This strongly indicates lower temperatures than the melting point of wax. The wax comb from recipe 9 is both cooked and pressed, and it would fit the description of “the forseid pomys sodden” of recipe 10 perfectly. The quantities listed in recipe 10 also generate more questions than guidance. If “tunnynge” is used as a volume measure of typically 252 or 265 gallons (Rowlett, 2005) and after adding the must is topped off with water, twenty gallons of pressed comb cooked in 3 gallons of malt seems like too small a ratio of sugar to liquid to make workable mead. The combs or “pomys sodden” could conceivably have more crystallized honey remnants left to add to the must but experimentation showed this to be insignificant. Unlike recipe 9 where the combs are washed, in this recipe the comb pomys is truly boiled in the wort/must. Another indication the wax is heated above melting point in this recipe, is that waxy scum will float to the top, just like when clarifying honey, and would have to be removed, as instructed by “scome hem wel til thei be cleer inowgh”. And while Hieatt & Butler thought the small quantity of pepper and cloves “would not make a very spicy drink,” adding boiled wax to the mix significantly changes the flavour profile, as wax adds a distinctive spicy, earthy taste due to contact (contamination) with propolis and pollen. The ingredients listed in recipe 10 do not seem to be complete either. The last clue is at the very end, where the instruction seems to include a duplication: “put it into the vessel [cask] into the tunnynge [tun]”. In the medieval age the word “tunnynge” can be interpreted as either a measurement (a ‘tun’ or a barrel of 252 or 265 gallons, a defined unit of volume in the 14th century) or an action (tunning). As discussed, when the recipe was emulated with “tunnynge” as a measurement, it added too much volume to the amount of honey and malt for a proper ferment. When “tunnynge up” is interpreted as an action, the sequence becomes “put it into the vessel into the tunned up previously mentioned mead”, or, use a transporting vessel to move the wort/must and add it back “put it therto” into the barrel of “the forseid mede”, or, the mead made with recipe 9. This would indicate recipe 10 is not a stand-alone recipe, but instead uses the mead made in recipe 9 to make something else, called “fyne meade and poynaunt”. The combined recipes make a braggot-like mead, except instead of adding honey and spices to re-ferment an ale (as a typical medieval braggot), it adds wort (malt) and spices to mead (similar to modern braggot, or malted mead). This would make recipe 9 and 10 the earliest known medieval recipes for malted mead. Our modern understanding of the chemistry involved in fermentation does not necessarily translate into an easier interpretation of medieval brewing recipes. This paper presents an alternative view to the current interpretation of mead no. 9 and 10, part of V: Goud Kokery and published by editors Hieatt & Butler in the publication Curye on Inglysch. Hieatt & Butler (1985, 150) postulate that the terms "forseid pomys sodden" in recipe 10 "[here] ‘pomys’ translates as apples" and "evidently refers to a recipe the scribe has omitted." Through careful experimentation the conclusion was drawn that the word pomys does not translate as apples, or apple pressings, but as generic pressings, and that it does indeed refer to the previous recipe no. 9 rather than to a non-existing missing recipe. As part of these experiments, the terms boiling and seething as used in these two recipes were also re-evaluated. When interpreted within this broader context, the two mead recipes work surprisingly well together, and each makes an excellent product. When recreating from medieval brewing recipes, it can be beneficial to understand a recipe not only by its individual components, but also within a broader context and to be not too literal, or modern, in our interpretation (See Figure 8). Anderson, R., 2005. The Transformation of Brewing: An Overview of Three Centuries of Science and Practice. Brewery History Society. Available at: <http://www.breweryhistory.com/journal/archive/121/bh-121-005.htm> [Accessed 11/2/2017]. Butler, C., 1609. The Feminine Monarchie. Oxford: Printed by Ioseph Barnes. Digby K., 1669. Digby, Kenelme. The Closet of the Eminently Learned Sir Kenelme Digby Knight Opened, 1669. The Project Gutenberg EBook of The Closet of Sir Kenelm Digby Knight Opened. Anne MacDonell (ed. ), 2005. Available at: <https://www.gutenberg.org/ebooks/16441> [Accessed 11/2/2017]. Hagen, A., 1995. A Second Handbook of Anglo-Saxon Food and Drink: Production and Distribution. Norfolk, UK: Anglo-Saxon Books. Harrison W., 1577. Description of Elizabethan England (from the Holinshed's Chronicles). Available at: <https://sourcebooks.fordham.edu/mod/1577harrison-england.asp> (Accessed 11/2/2017). Hieatt, C. B. & Butler, S. (ed), 1985. Curye on Inglysch, English culinary manuscripts of the 14th century (including the Forme of Cury). Early English Text Society. London: Oxford University Press. Hyll, T., 1579. A Profitable Instruction of the Perfite Ordering of Bees. London: by Henrie Bynneman. Available at: <http://www.gutenberg.org/ebooks/47765> [Accessed 11/2/2017]. Lawson, W., 1631. A New Orchard and Garden. London: by Nicholas Okes at the Golden Vnicorne. Available at: <https://www.gutenberg.org/files/29058/29058-h/29058-h.htm> [Accessed 11/2/2017]. Platt H., 1594. Jewell House of Art and Nature. London: Peter Short. Rasmussen, S.C., 2014. The Quest for Aqua Vitae. SpringerBriefs in History of Chemistry. Rowlett, R., 2005. How Many? A Dictionary of Units of Measurement. University of North Carolina. Available at: <http://www.unc.edu/~rowlett/units/dictT.html> [Accessed 11/2/2017]. Unger, R. W., 2004. Beer in the Middle Ages and the Renaissance. Philadelphia, PA: University of Pennsylvania, Press.